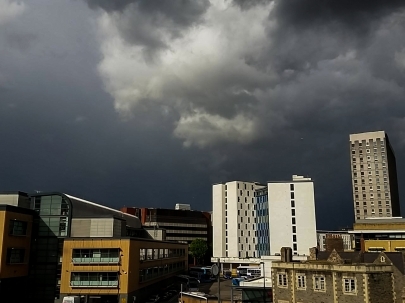 If you want more Bristol storm action; check out my Storm Blog shortly as I was treated to another show today (and yes...I had to abandon writing this post to follow it!). Bar a few more days of work and a visit to Gloucester to see Hannah, the week has otherwise been uneventful. Saturday involved a morning of work, before an afternoon editing the website, before I decided to watch Bristol City (sorry for swearing) play Brighton on Sky Sports over at the Bar 501. Although it was entertaining to watch Taylor miss an easy shot again, credit where credit is due, City played well and won the game 1-0. 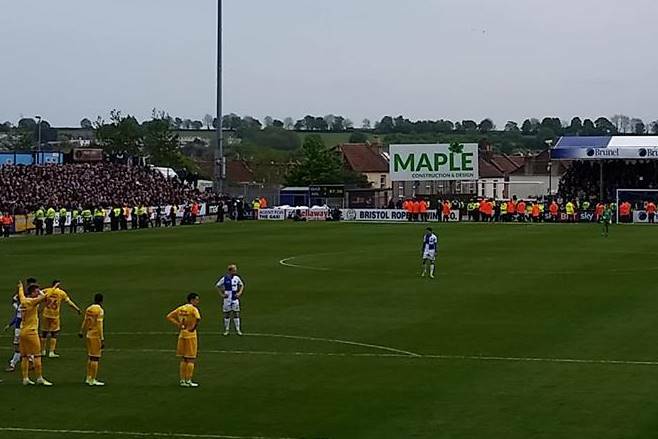 The main highlight of the weekend was that of Bristol Rovers' last game against Millwall. Rovers had nothing to play for, Millwall had the Play-Offs to drop out of. It was a charged game with both teams refusing to be beaten. Some of the players that have been a bit lacklustre of late appeared to be hungry to finish the season with a flourish. Sadly, the first two goals went to Millwall, under quite dubious circumstances - especially their second - with their goalscore a clear 2 yards offside with his strike. Soon after Jermain Easter finished a great eeffort from Billy Bodin to make it 2-1. Our elation was short-lived as Millwall soon made it 3-1 after some poor defending by Chelsea loanee, Jake Clarke-Salter. The game went into half time at 3-2 after Billy Bodin set up Rovers' fan and highly ranked player Chris Lines, who drilled the ball beyond the hands of the Millwall goalkeeper. It was a superb shot and well taken goal. Millwall were looking rather edgy when the second half began and, with the strong wind now on Rovers' side, they pushed forward and applied heavy pressure on the Millwall defence. A free kick just outside the box was awarded after a Millwall foul and Man of the Match, Billy Bodin, stood up and scored a tremendous free kick. 3-3 and as it stood, Millwall were out of a play-off place. Tensions were high and, as elated as Gasheads were, I'm sure many were anxious in case there was trouble after the game. It wasn't long before we lost the ball (a clear foul on Luke James as he was clear through on goal - but not given) and led to a Millwall corner, from which they scored from. 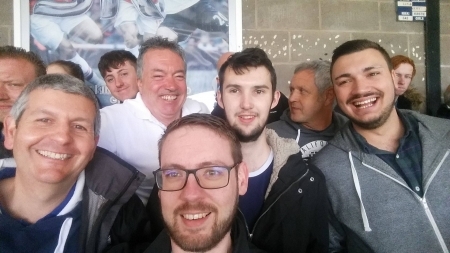 The game ended at 4-3 and, despite the loss, most Rovers fans were left feeling exhilarated from an exciting game of football. It's going to be some time before our next game - friendly, competitive or otherwise, so will be a bit of gap before I catch up with my football buddies Jack and Liam, as well as seeing my uncle Andy as often. Still - roll on the 2017/18 season and fingers crossed for another thriller. And with that, comes the end of another week. Lots planned for this week ahead, so keep tuned for my next update. Until then, have a great week! P.S. Here is the video of the storm that distracted me from this blog entry! Enjoy!